Belleville, ON (October 2, 2017) – The Belleville Senators announced today that they have partnered with Canada’s leading fan engagement platform provider, Stadium Digital, to officially launch its new digital platform, BellevilleSens.com. As the digital home for the team’s historic inaugural 2017-18 American Hockey League season, the site is the go-to destination for Senators fans. 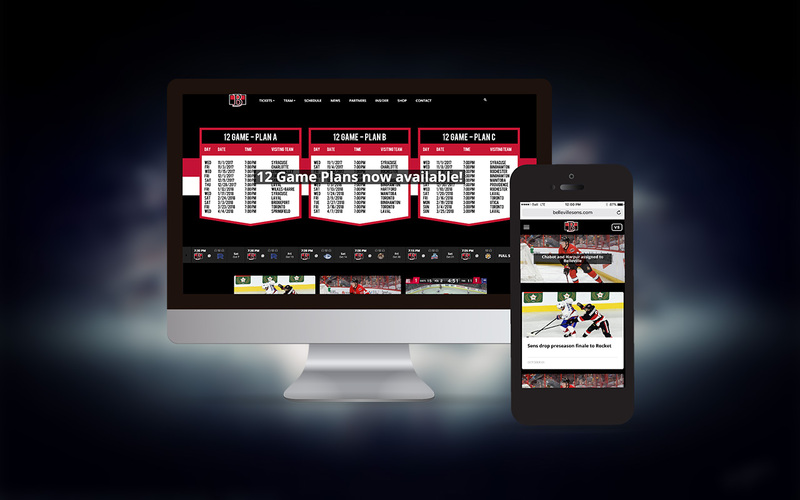 The platform features a dynamic content hub to share Senators news, stats, ticket offers, information and highlights. The site is fully optimized for all platforms. BellevilleSens.com also features original content showcasing elite players and introduces the next generation of Senators stars. Fans will also now be able to join Belleville Insiders, the best way to follow the team. Members will receive first access to news and information including exclusive content, special team and sponsors offers and community events. This is the second AHL team to launch with Stadium Digital, following the Toronto Marlies last season. Stadium Digital has confirmed that they are actively engaging other AHL teams to expand their industry-leading infrastructure across the league. The Sens begin their inaugural season October 6th with a trip to Laval, Quebec. After a nine-game road trip to start the season, Belleville’s home-opener at the renovated Yardmen Arena will take place November 1st against the Syracuse Crunch. The Belleville Senators are an American Hockey League franchise set for their inaugural season in 2017-2018. The team serves as the primary professional development affiliate of the Ottawa Senators in the National Hockey League. Upon their relocation to the Bay of Quinte area, the team will play its home games in the newly renovated Yardmen Arena. You can follow the Belleville Senators on their official Facebook, Twitter and Instagram pages via @BellevilleSens or visit us at BellevilleSens.com for more information. Stadium Digital specializes in the creation and management of content and technology to deliver products in the areas of sponsorship, fan engagement, ticketing and e-commerce. The company supports sports properties and their partners realize the full potential of their brand and content rights. Its client include the CHL, WHL, QMJHL, OHL and all 60 teams, Hamilton Tiger-Cats, Winnipeg Blue Bombers, Toronto Argonauts, Toronto Marlies, Belleville Senators, Cycling Sports Group (Cannondale), Toronto Rock, Golf Canada, Canada Snowboard and the Greater Toronto Hockey League. For more about Stadium Digital, please visit StadiumDigital.com.